Identify the position of each removed part. 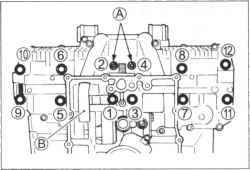 Organize the parts in their respective groups (e.g., intake, exhaust) so that they can be reinstalled in their original positions. 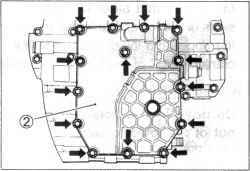 • Remove each PAIR valve pipe and hose. 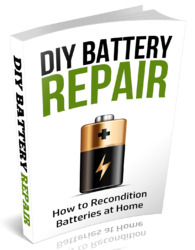 Refer to page 2-10 for installation procedures. • Remove the signal generator cover ©. • Remove all of the spark plugs. 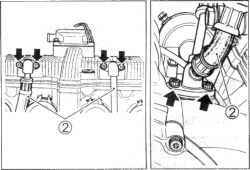 • Turn the crankshaft clockwise and align the "T" mark on the signal generator rotor with the center of the pickup coil. 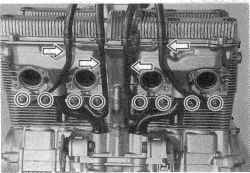 Also, position the notches (2) on the right end of each camshaft as shown. 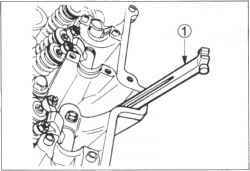 • After removing the spring holder bolt @ and spring ©, remove the cam chain tensioner ©. 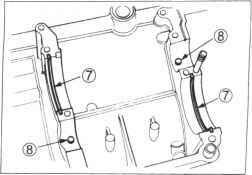 Be sure to loosen the camshaft journal holder bolts evenly and in a crisscross pattern. See page 3-49 for camshaft inspection. 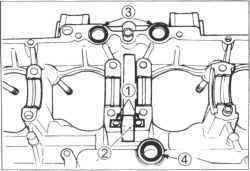 • The cylinder head can be removed when its twelve 10-mm nuts are removed. 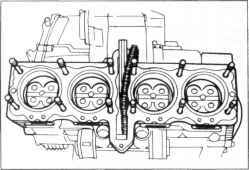 When loosening the cylinder head nuts, loosen each nut little by little, in descending order, according to the numbers cast on the cylinder head. • Firmly grip the cylinder head at both ends and lift it straight up. If the cylinder head does not come off, lightly tap on the finless portions of it using a plastic mallet. Be careful not to damage the fins when removing or handling the cylinder head. 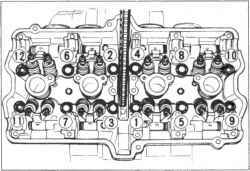 See page 3-52 for cylinder head servicing. Remove the left and right oil pipes ©. • Firmly grip the cylinder block at both ends and lift it straight up. If the cylinder block does not come off, lightly tap on the finless portions of it using a plastic mallet. Be careful not to damage the fins when removing or handling the cylinder block. • Scribe the cylinder number on the head of the respective pistons. 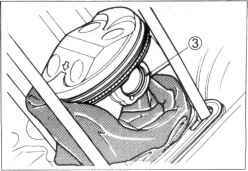 • Place a clean rag over the cylinder to prevent any parts from falling into the crankcase. 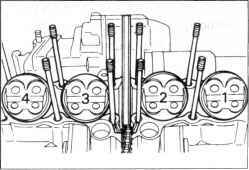 • Draw out each piston pin and remove the pistons. 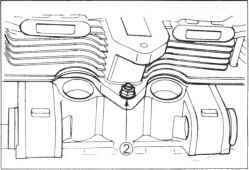 See page 3-64 for piston and cylinder inspection. 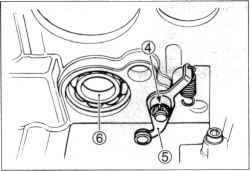 • Remove the signal generator stator (along with the pickup coil) (5) and oil pressure switch ©. 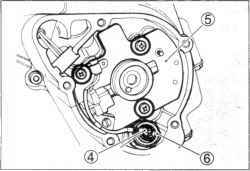 • Hold the starter clutch using the special tool and loosen the clutch spring set bolts in a crisscross pattern. Then, remove the bolts. 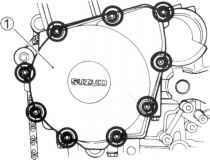 • Remove the clutch pressure plate clutch drive plates and clutch driven plates. See page 3-68 for the clutch plate inspection. Hold the clutch sleeve hub using the special tool and then remove the nut. 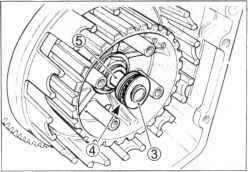 With the spacer and bearing removed, the primary driven gear assembly can disengage from the primary drive gear. Remove the primary driven gear assembly along with the generator/oil pump drive gears. 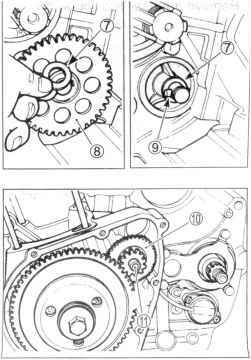 • Draw out the gearshift shaft ©, and then remove the gearshift cam driven gear (D.
When removing the gearshift cam driven gear, do not lose the gearshifting pawl (3), pin @ and spring ©. Do not lose the circlip, pin and the washers. 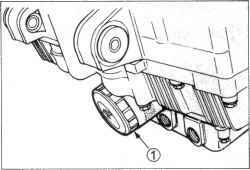 • Hold the starter clutch assembly using the special tool and then loosen the starter clutch mounting bolt. 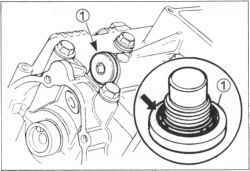 Do not remove the starter clutch mounting bolt at this stage, only loosen it. 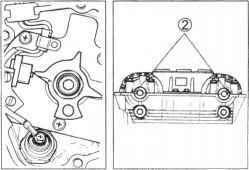 You will need to use it in conjunction with the special tool when removing the starter clutch assembly. 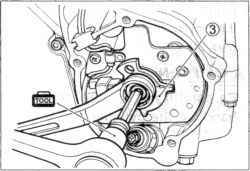 • Remove the starter clutch assembly © from the crankshaft using the special tool. 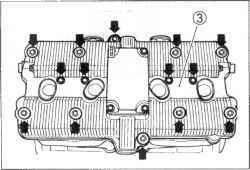 See page 3-69 for the starter clutch inspection. Do not lose the O-ring, switch contact and spring. 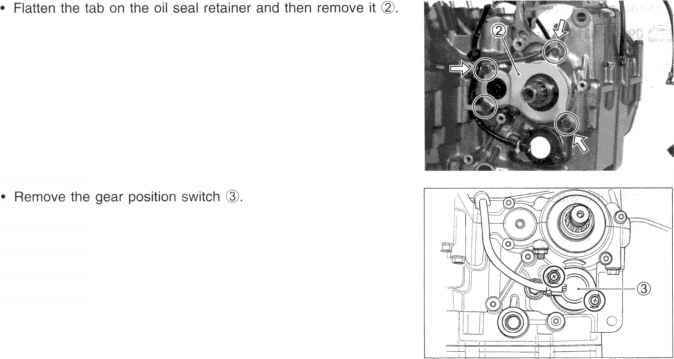 • Remove the countershaft bearing retainer (3). 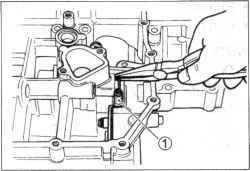 • Remove the upper crankcase bolts and nut. 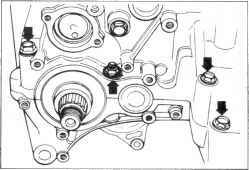 • Remove the lower crankcase bolts and nut. 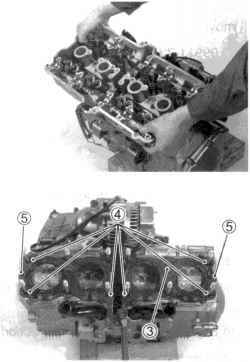 • Loosen the crankcase bolts in descending numerical order and then remove them. Two alien bolts are located at position ® to tighten the crankshaft. Make sure that all of the bolts are removed. Then, tap the sides of the lower crankcase using a plastic mallet to separate the upper and lower crankcase halves and then lift the lower crankcase off of the upper crankcase. Do not allow the crankshaft journal bearings to drop out of the lower crankcase. 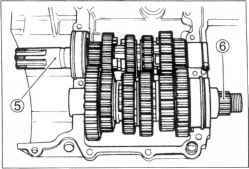 If it is difficult to separate the crankcase halves, set the proper bolt and nut to the crankcase by separating the upper and lower crankcase halves, as shown in the illustration. * Remove the crankshaft assembly d) from the upper crankcase. * The crankshaft thrust bearings (3) are located between the crankshaft assembly and upper crankcase. 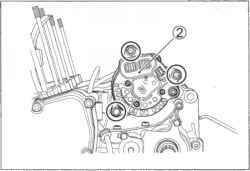 * See page 3-79 for the crankshaft and con rod servicing. 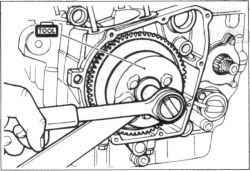 * Do not remove the crankshaft journal bearings unless absolutely necessary. * Make a note of where the crankshaft journal bearings are removed from so that they can be reinstalled in their original positions. • Remove the countershaft assembly © and driveshaft assembly ©. See page 3-73 for the countershaft and driveshaft servicing. Do not lose the C-rings and bearing pins. 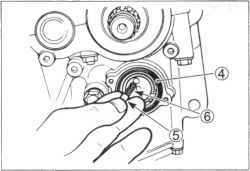 • Unhook the gearshift cam stopper spring © from the lower crankcase. 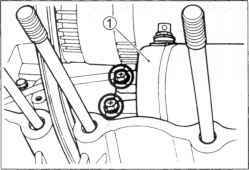 • Remove the circlip (D from the gearshift cam, then draw out the gearshift cam (3) from the opposite side. Rotate the bearing © in the crankcase by hand to inspect for abnormal noise and smooth rotation. Replace the bearing if there is anything unusual. • Remove the O-rings and dowel pins. What type of rankshaft is in the suzuli bandit? 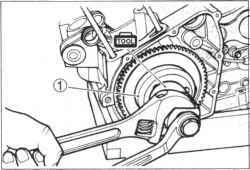 How to use a starter clutch wrench? 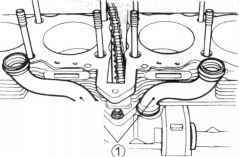 Where is the crank sensor on a suzuki bandit 600s? How to remove 600 engine head? What engine oil goes into a suzuki gsf 600? 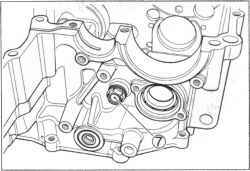 How to assemble a CBR oil pump dot on gear? How to remove a bandit cylinder head? What weight oil for Suzuki gsf 600? How to remove suzuki bandit stator cover? What engine oil goes in a 1996 bandit 600? How to remove piston gsf600? 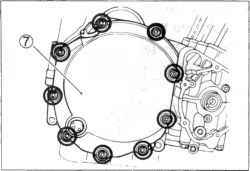 How to remove an alternator on suzuki bandit 600? How to replace bandit 600 block to head return feed pipes? How to bandit 600 cam removal? How difficult is it to replace a bandit motorcycle cam chain tensioner? How to fit a cam chain tensioner suzuki gsf 600? 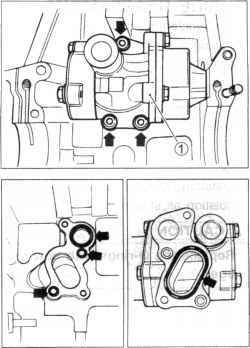 How to remove the oil pump on a 1996 Suzuki Bandit this? 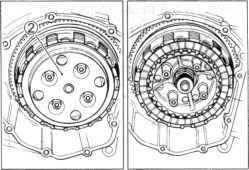 How to remove clutch assembly on a honda 600cc engine? How to replace starter motor pin on bandit? 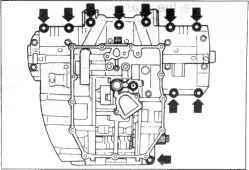 How to fit engine covers suzuki bandit 600? How hard is it to change cam chain in a suzuki bandit? How to replace cam chain tensioner on 600cc bandit? How to disassemble suzuki bandit n600 engine? 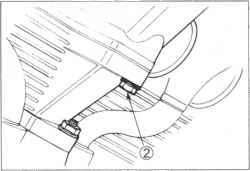 How to access cam chain tensioner on 1996 suzuki bandit 600? How to change suzuki signal generator cover? How long to change cylinder head gasket on 600 bandit? Which engine fits bandit 600 1996? 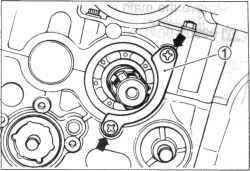 How to change thrust bearing bandit? How easy put a cam chain in 600 bandit? 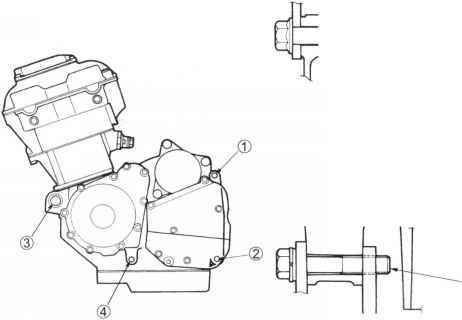 How to switch the engine cylinder bike suzuki bandit? 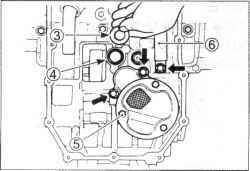 How to change engine gear on 600cc suzuki? 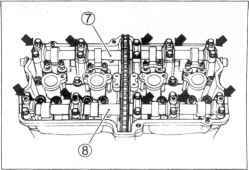 What is the torque spec for cylinder head installation on a suzuki 600 bandit? 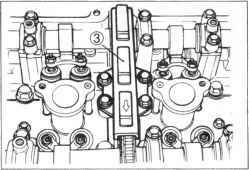 How to strip gsf engine? How to lift head of 600 bandit? What holds starter gear on shaft gsf 650? What holds starter gear in place gsf 650? How do i remove starter idle gear gsf 650? Why plain bearings should be reassembled in their original order? How to take the head off a suzuki bandit engine? How to replace head gasket gsf 600? How to disassemble a 600cc engine? How to remove a motorcycle cylinder head bandit? How to remove a suzuki bandit motorcycle cylinder head? 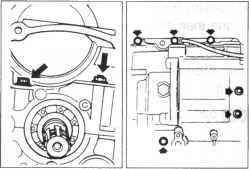 How to replace a engine gasket on a 2000 suzuki bandit s? How to remove the starter gear on a suzuki bandit? How do i remove a alternator bolt motorcycle bandit? 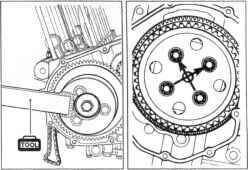 How to align a timing chain in a bandit straight 4 motorcycle engine? How to remove gsf600 head bearing? What is the size of the orings on a suzuki bandit gsf 600? How to remove Suzuki bandit engine cover off? 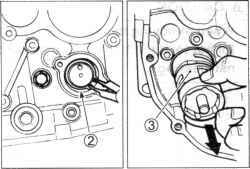 How to change crankshaft oil seal on suzuki bandit? Can you xhange head on bandit 600 without taking out wngine? Which order do I fit bandit engine gaskets in? How to strip down a suzuki gsf 600 engine? 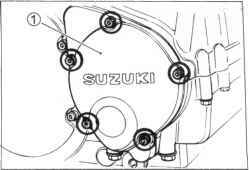 What size is a suzuki starter clutch nut?